Since it’s after midnight, there’s a game in 12.5 hours, and afterwards I’m driving the 10 hours to Philadelphia; this is going to be a short post. On Saturday I finished the post for Friday, watched the British Open, and did some leg exercises to help with my knee. I went to the game with Barry again and he picked me up 4:30. We were parked at Paul Brown Stadium at 4:45 and we walked over to Great American Ballpark and tried to find a place to eat before the game. The wait was long at every place, so we just had a beer at Holy Grail Bar & Grille and then went across the street to the ballpark. 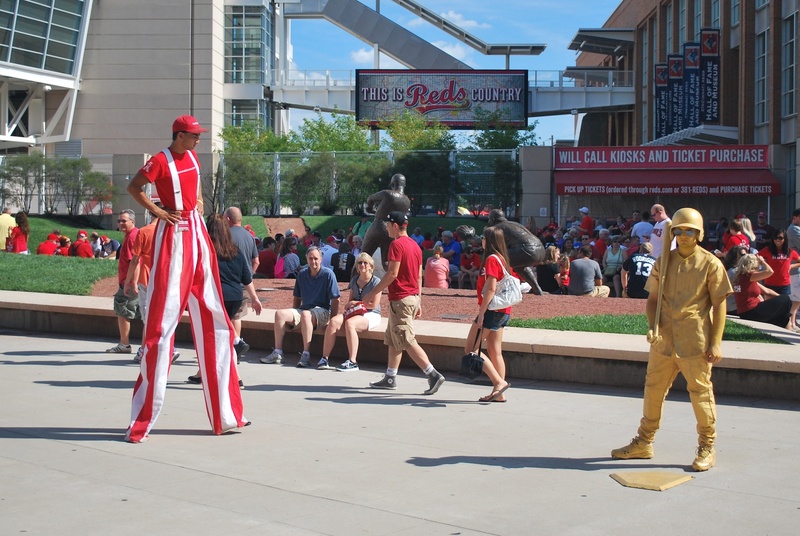 While Barry was waiting in line to get the tickets I got a picture of a man on stilts and the human statue, who were outside of the stadium. I don’t know what the occasion was but there was also a guy inside the stadium that was doing magic tricks. I know that what he was really doing was slight of hand but neither Barry nor I could pick up on it. Well played magic man, well played. Once we got our tickets and got inside we headed for the upper deck. 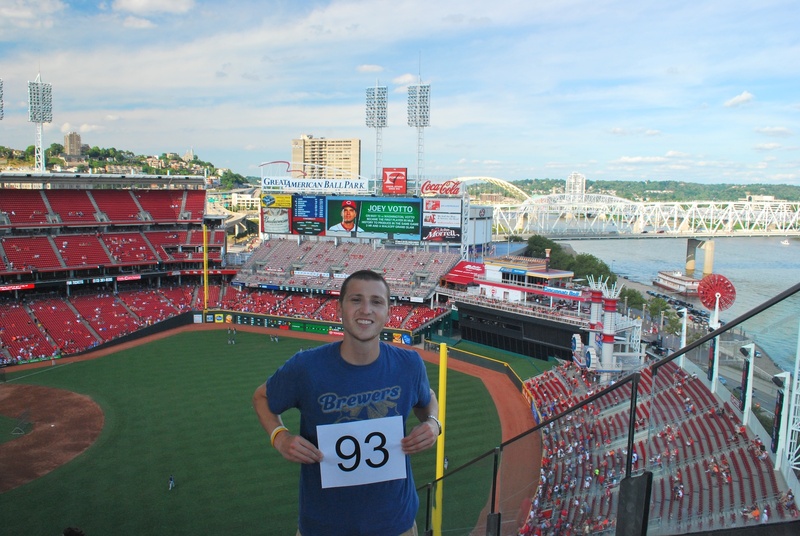 I got game photo number 93 while standing on a seat in section 537. The closest bridge is the Central Bridge, and the one in the distance is the Dan C Beard Bridge. After getting the picture taken we went down to the field level and got some food from Mr. Red’s Smokehouse. 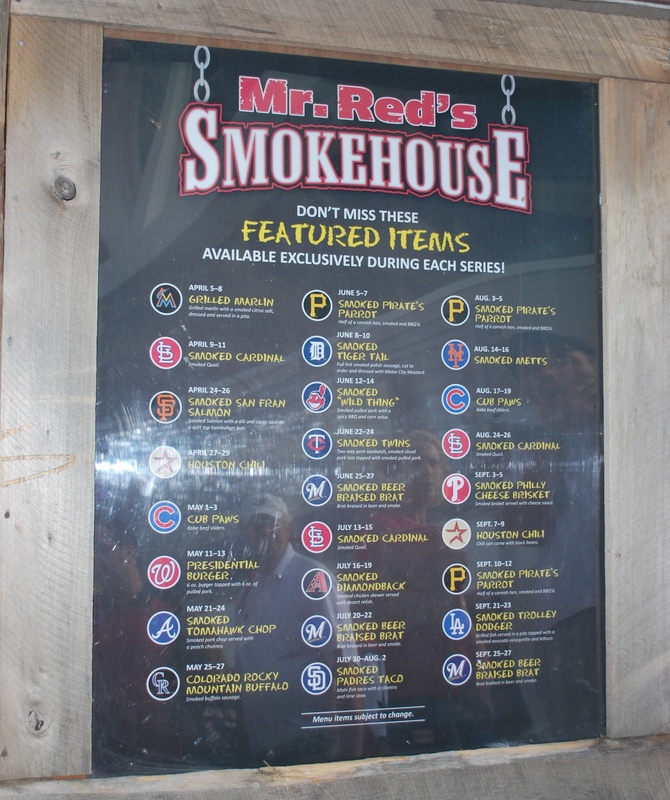 They offer specials from each visiting team’s city (when they’re in town). When the Brewers are in town they have a smoked beer braised brat. You can click on the image to get a closer look (if you’re interested in seeing what they offer when various teams are in town). I didn’t get a brat because I can get that anytime. 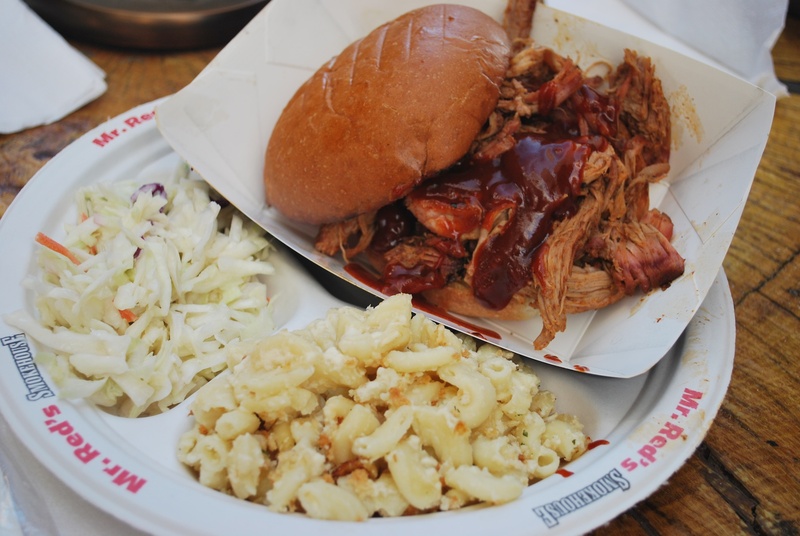 Instead I got the smoked pulled pork sandwich with cole slaw and mac & cheese as sides. It was delicious. Something funny happened before I ate my dinner. Barry and I were eating at a circular bar table with no chairs or stools. There was a married couple probably in their upper 40’s eating at the same table. I pulled out my hand sanitizer and “washed” my hands before I dug in. I set the small flip-top bottle on the table and the woman quietly commented; “that’s nice that they have those.” I didn’t really think anything of it but then she reached over, picked it up and proceeded to use some of it on her hands. Barry and I kind of looked at each other as she reached back over and set it down where I had left it. Eventually she realized that it was actually mine and she started apologizing profusely. Her husband laughed and said to her; “here’s a fork, do you want some of his pulled pork too?” We had a good laugh and she apologized a few more times before they left. I obviously was not upset and thought the whole thing was pretty funny. Stubbs popped out and Rickie Weeks made a really nice play to catch the fly ball down the right field line. The next five at bats for the Reds went as follows: single, single, RBI single, sacrifice fly, two-run home run. Just like that the Reds had a 4-0 lead. Not cool. In the fourth inning Travis Ishikawa doubled and Corey Hart singled to drive him in. 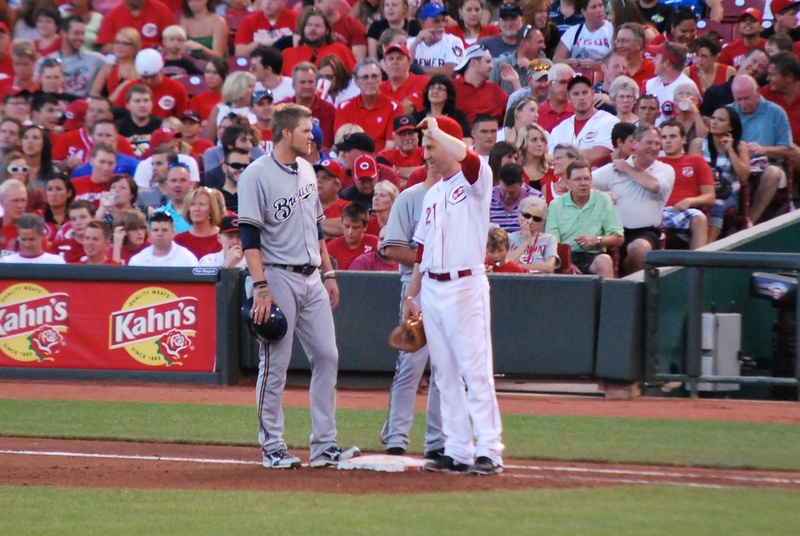 Here’s Hart chatting with Todd Frazier at first base after his single. 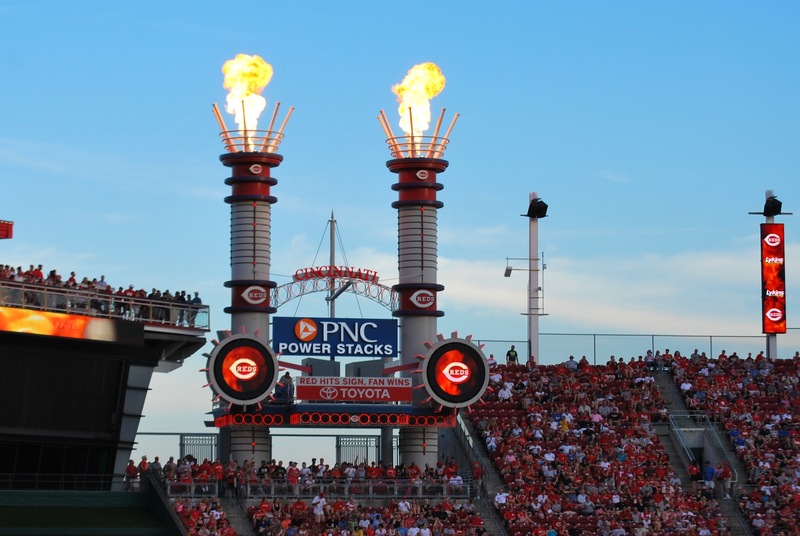 When a Reds pitcher strikes out a batter they shoot flames from the Power Stacks in right center field. I made sure to capture this because while it is wasteful it’s also kind of cool. In the sixth inning Ishikawa doubled again and Braun followed with a single, putting runners on the corners with nobody out. I told Barry that I was hoping Braun would steal second to stay out of the double play. On the first pitch Ramirez did just what I was fearing. Ishikawa scored from third but the chances of a big inning were drastically reduced now that the bases were empty with two outs. 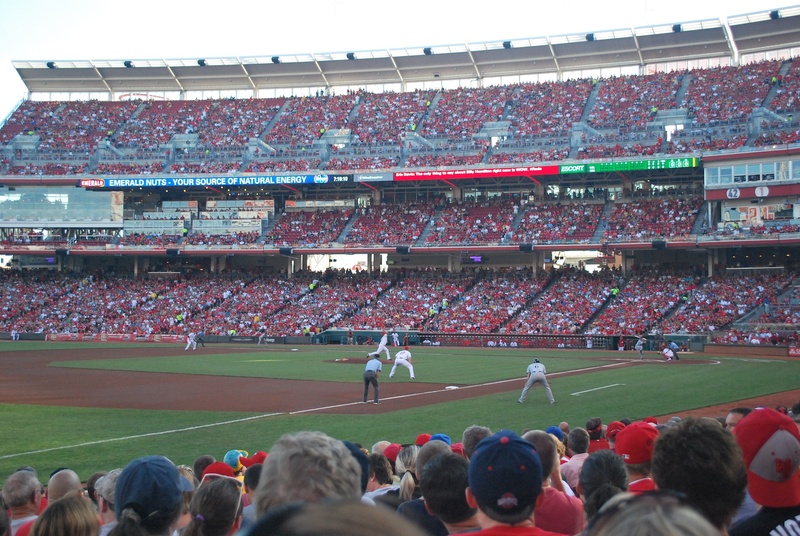 In the bottom of the seventh the Reds tacked on two insurance runs when Brandon Phillips took Jose Veras deep. 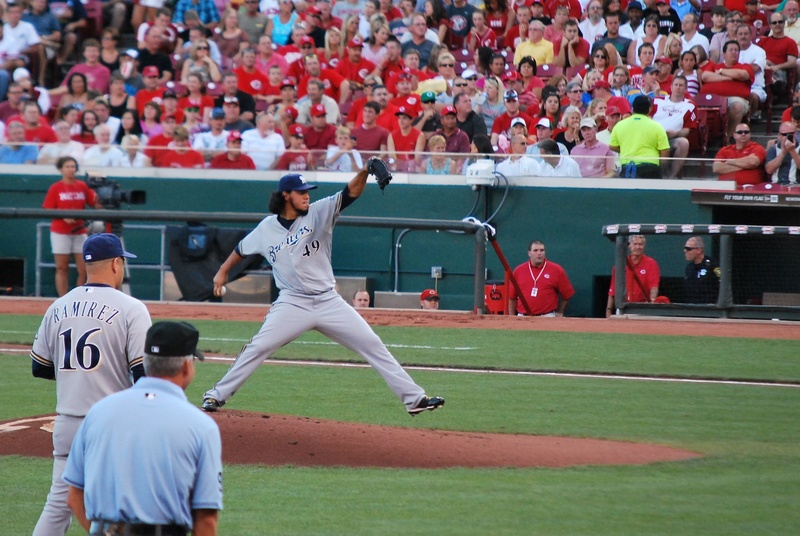 The Brewers went in order in the 8th and 9th, and that was all she wrote. Final Score: Reds 6 – Brewers 2. I’m really hoping that the Crew can avoid the sweep and at least give me something good to think about on my 10 hour drive to Philadelphia after the game tomorrow. In case you don’t know, there are 14 bats on top of those stacks to honor Pete Rose because MLB restricted the Reds from displaying his number along with other players. I think that’s really awesome of them and obviously also really lame of baseball. Someone had mentioned that the last time I was in Cincinnati. I agree with you about the restrictions they’ve put on mentioning Rose.